Alexander Eristavi works for the UK’s National Fraud Intelligence Bureau (NFIB), which is a part of the City of London Police. In August 2018 he took on the role of NFIB Business Stakeholder Manager, having already been promoted through the ranks to Detective Inspector. 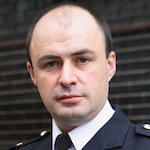 Alexander first joined the City of London Police as a Special Constable in 2004. He found the role immensely rewarding and subsequently started as a regular police officer in 2006. Alexander spent three years working in uniformed and ‘plain clothes’ policing and in 2009 was offered an opportunity to join the Economic Crime Directorate (ECD), working as an intelligence officer within a team responsible for developing intelligence related to ‘Boiler Room” fraud. He has developed large and complex cases that resulted in arrests and prosecutions in the UK and abroad. In 2012, Alexander devised a new strategy for suspending websites and telephones used for fraud. This method later led to a dedicated disruption team being formed within the NFIB. Alexander’s time at the NFIB has also seen him assist the launch of the Police Intellectual Property Crime Unit (PIPCU). Alexander has worked as an investigator at the National Fraud Desk and he has supervised the Cyber Crime team. He also led a team responsible for the assessment of all the investment fraud matters reported through the national fraud reporting centre, Action Fraud.